Green Lents welcomes people of all races, all religions, all genders, all countries of origin, and all sexual orientations in its programs and spaces. We prioritize the safety of our volunteers and constituents, and reserve the right to deny services or entrance to anyone for any reason that does not discriminate against the protected classes under Oregon state law (http://www.oregon.gov/boli/TA/docs/t_faq_protected_classes.pdf). ​Angelica was born in Guanajuato, Mexico and has lived in Portland for over a decade with her husband and son. She has a passion for combining community organizing, accessibility to healthy fruits and veggies, and environmental education. Angelica is heavily involved in Lents and East Portland and is a strong advocate for reducing barriers to engagement and participation. She also works with Growing Gardens as a Community Organizer. Since becoming involved with Green Lents in early 2018, Angelica has played an instrumental role in increasing access for Lents Latinx community members. What she loves most about her job is constantly learning new things and meeting new people. In her free time, she likes to cook food, spend time with her family, and build community. 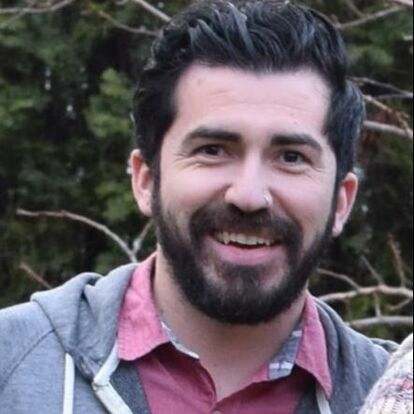 Adam has been involved in the Livable Lents listening project since 2015, and was hired in 2016 to direct Green Lents' programs after he helped lead the creation of the Lents Strong action plan. Adam is a community organizer with a Master's in Urban & Regional Planning from Portland State University. Originally from South Carolina and Rhode Island, Adam has a five-year track record of incubating successful community projects in Portland at the grassroots level, including as a co-founder of 350PDX, a grassroots climate action organization. Adam is committed to environmental justice, working to build partnerships and opportunities for community leadership. Since joining Green Lents, Adam has enhanced our programming to better engage people of color, renters, and people who speak languages other than English. He coordinates several projects, including the Lents Green Ring, our housing affordability work, and spends copious time writing grant applications and building relationships. Jasmine joined Green Lents in the beginning of spring 2019. They are originally from Nevada and graduated from Portland State University with a degree in art, conflict facilitation, and systems science. As a recovering workshop junkie, she has also spent time studying basic permaculture, yoga, process-oriented psychology, and more. Their professional experience is just as diverse, ranging from massage therapy to project organization and public outreach. Jasmine is passionate about seeking innovative ways to move towards a more resilient and sustainable way of living - and they appreciate the work Green Lents does on place-making, equitable community-building, and environmental care. Overall, they are excited about Green Lents continuing to foster a more thriving and livable place! Lorena joined Green Lents as a summer intern in June 2018. She is involved in the Lents Green Ring Wayfinding Project through a fellowship with the Institute of Sustainable Solutions. She now coordinates a class collaboration between Green Lents and a PSU Public Administration class. Lorena is currently enrolled in the Ph.D. Program in Urban Studies at Portland State University. Originally from Brazil, she is a forester and has worked with community gardens and in environmental consultation. In Portland, she is engaged in teaching activities with children, youth, and academic students. Her areas of expertise include environmental justice and urban forestry. Lorena likes to feel connected with nature through her job, spirituality and seeking for knowledge. Renata loves living in Lents because of its social diversity and close proximity to amazing eateries. She has professional experience in project management and event coordination in the transportation and education sector, and was a board member for Portland arts nonprofit PDX Pop Now! As Green Lents' Development Co-Chair, she gets to help sustain the longevity of the organization by doing two things she enjoys-- planning fun events and connecting with people. When she's not working at Portland State University or doing Green Lents work, she enjoys playing with her corgi Monty, eating tacos, bicycling (mostly to food destinations), and throwing barbecues in her backyard. Rhesa is a new(ish) transplant to Lents, having moved here in 2008. She has enjoyed being a part of the Lents community, especially in the many ways her Lents neighbors show their generosity of spirit with shared resources. She was initially intrigued by Green Lents as an organization while volunteering with the Tool Library. Such a simple but brilliant idea of sharing tools amongst neighbors! She is appreciative of having benefited from many Green Lents projects, including enjoying books from Little Libraries around her block, eating berries from the Malden Ct. Community Orchard, and this year, even having volunteers plant native perennials in her garden to increase Pollinator Habitat. Katie is an urban planner, passionate about working with people to create great places. Lents is one of her favorite great places. She loves how people come from so many different backgrounds, yet find common ground to work together to improve this small, special corner of the universe. She got involved with Green Lents and the wider neighborhood several years ago as part of a project in graduate school. Since then, she has worked for GL and now serve on the board. She loves how responsive GL is to community needs and how enthusiastically the GL community supports a new idea for a project or event. She can't wait to see where it goes from here! ​​Stephanie hails from the East Coast but now happily calls Lents her home. Her favorite thing about Lents is the rich diversity of cultures represented and all of the wonderful programs that Green Lents brings to our neighborhood. She first learned of Green Lents through the plant swap and the m​ore she learned about Green Lents projects, the more she knew she wanted to get more involved. With a background in community development, education, and consumer finance, she felt she could lend a hand in the role of treasurer. When she's not working at Clackamas Community College, she loves spending time with her pets, baking, gardening, and discovering new restaurants around Lents. Izzy Armenta is a former Green Lents Confluence Fellow. During his time with Green Lents he helped coordinate Livable Lents outreach to better understand livability concerns and ways to address them using the community's voice as the guiding principle. After serving two exciting AmeriCorps terms he has gone on to join Oregon Walks as their Transportation Justice Advocate. His current role finds him working with YEJA youth leaders in mapping walking barriers East Portland youth face and identifying ways to advocate to address those barriers. When he's not working he also serves on the board of Confluence Environmental Center, watches cheesy horror films, and listens to punk records at inappropriately high levels. Green Lents is a non-profit that began as a community group in 2009 and is dedicated to providing leadership, educational and volunteer opportunities in and around the Lents neighborhood to support vibrant and sustainable communities. Launched Community Watershed Health Project Received a SPACE Grant for listening project and watershed health challenge survey in spring and summer around SE Yukon st.
Livable Lents becomes a project of Green Lents, canvasses over 1,000 homes and collects more than 600 surveys in four languages. Worked with community members to improve the Malden Ct. Community Orchard site. Creation of the Lents Strong action plan, hosting focused community conversations in six different languages. Livable Lents project continues, and canvasses, successfully surveying another 500 residents in 5 languages. Co-hosted the massive open-streets event, Oregon Walkways: Lents Founders Fair. Hosted Lents Green Ring Community Action Forum, attracting a diverse crowd of over 100 residents. Co-designed an intersection painting with residents living at NAYA Generations and artist Rodolfo Serna, to be painted in summer 2019. Engaged fifty diverse Lents-area homeowners in five languages, ultimately creating a tool to easily navigate eligibility for Home Repair grant and loan programs.